Drive Targeted Visitors To Your Site For as Little as ONE PENNY! Do you realize that you can actually be #1 in our search engine? That's right with our PPC program you can DOMINATE the search ranking and get the exact people you want to visit your web site. Adlandpro’s Pay-Per-Click program is fundamentally a keyword auction. Advertisers place a monetary “Bid” on a keyword that they wish to be associated with their particular ad. Words and Phrases like “Home Business” and “Free” are premium keywords/phrases which fetch higher bids because these are the words that users search for frequently. The higher the bid on the keyword or phrase, the higher up your ad placement will be when the results are displayed to the person searching the site. When a user clicks on your ad, the click is tracked and your account is debited by the amount that you bid for any clicks corresponding to that keyword. If you bid 5 cents for the keyword "free classifieds" and another user bids 2 cents and one more user bids 7 cents, your ad will be listed second in the search results. To improve your ranking, all you would need to do is change your bid to 8 cents, and your ad would then be listed first. It will remain at the #1 position until a higher bid is placed for the keyword. Instant Traffic. Skip all the time needed to build high search engine rankings and spend your spare time doing other, more enjoyable things. People find your site immediately after you are approved. Directs keyword-targeted visitors to your website (you pay only for results) Quality Traffic. Monitor and control your advertising (view and analyze statistics, modify ads and bids). See how your ad is doing. Increasing your qualified visitors by researching, expanding, and refining your current keyword phrases. Low-Risk advertising. You pay only for the clicks that you receive. 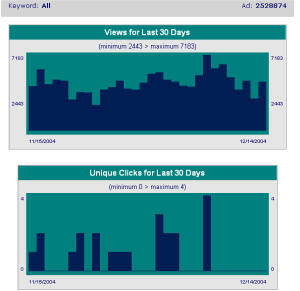 20,000 visitors to Adlandpro everyday increases your ad’s visibility on the internet. Paid search placement models are succeeding because consumers are finding relevant listings much faster on paid search engines, while advertisers are only paying for qualified lead traffic on a per-click basis. This makes paid search engine listings a win-win situation. In order to start, you require a minimum of $10 in your Paid Keyword account. You decide how much you want to spend and how quickly. You want to empty pool of available funds. The higher you bid, the quicker your funds will be used however, you will receive visitors faster. If you bid too low, your ads might be never seen and even if you have money in your pool no visitors will be delivered to your site. Since we are new to pay per click advertising, you will be able to find many keywords for which you can bid as low as $0.01 per click. How will I know that I am getting visitors? In addition, if you have access to your server log files, you can verify them and compare them with our statistics. How do I know that each click I receive is a legitimate click? We have developed an anti-fraud system which allows one user to click only once on your ad. Subsequent clicks from the same user will not be debited from your account. We also block auto-surfing technologies such as spiders and robots from clicking on your ads and rapidly depleting your account. What do you do to maximize my return on investment? We send reports every time someone places a higher bid on your keyword or phrase and lowers your ad position. You are notified periodically if your ad undergoes a period of inactivity (No clicks or views) so you can make necessary changes such as editing/adding/deleting keywords or changing the amount of your bids. You have the ability to monitor and modify your ad any time. Change ads, modify/edit/delete keywords and change keyword bids to take full advantage of the program. "If at any time our PKA system doesn't exceed your expectations, or there was at least one situation where we couldn't resolve issues you have brought to us, we will gladly provide you with double value of any other promotion we offer on our site." Yes, I Want To Take Advantage of the Paid Keyword Program NOW!